ON KEEPING THE FAST Great Lent is upon us, and on its threshold it would be good for the Christian to think about how he should spend the time of Great Lent, and above all, how he should observe the fast and follow the church rules. We need to keep in mind that on one… via … Συνεχίστε να διαβάζετε On Keeping the Fast by St. Philaret of New York — True Orthodox Diocese of Western Europe. Vladimir Moss: The mission of ROCOR and the Catacomb Church – a historical retrospective of the development of relationships The thesis of this Report is that since its foundation in 1920 the Russian Church Abroad has remained on the right path as long as it has acknowledged itself to be a part of the True… via … Συνεχίστε να διαβάζετε Vladimir Moss: The mission of ROCOR and the Catacomb Church – a historical retrospective of the development of relationships — True Orthodox Diocese of Western Europe. St. Philaret explains Vespers to the Youth Group circa 1964Discussion with a Youth Group about the Vespers ServiceMetropolitan Philaret (Voznesensky)When festal Vespers are served jointly with Matins, they are called the “All-Night Vigil.” Small Vespers are generally not served independently, but only on those days when the All-Night Vigil is served, and is served sometime… via … Συνεχίστε να διαβάζετε St. Philaret explains Vespers to the Youth Group — True Orthodox Diocese of Western Europe. The Power of the Cross In a sermon on the Sunday of the Adoration of the Cross, the late Metropolitan Philaret related the following incident: Nowadays it is often said that miracles occurred only in ancient times.. But here is a miracle which took place just before Russia’s bloody devastation, a miracle attested by eyewitnesses,… via … Συνεχίστε να διαβάζετε The Power of the Cross﻿ by St. Philaret — True Orthodox Diocese of Western Europe. 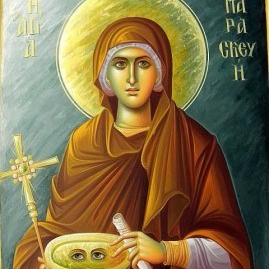 Encyclical at the Beginning of Great Lent 2019 Dearest Brethren and Fellow Wayfarers on the journey to eternal life, From the beginning of the Triodion, the hymnographer cries out after the 50th Psalm, “But trusting in Thy compassionate mercy, like David do I cry unto Thee: ’Have mercy upon me, O God, according to Thy… via … Συνεχίστε να διαβάζετε Encyclical at the Beginning of Great Lent 2019 — True Orthodox Diocese of Western Europe.